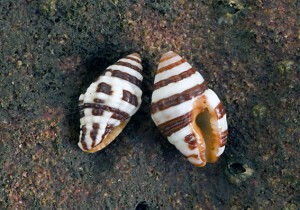 A small (20mm) species of predatory snail, the Red-mouthed Banded Whelk is found under large rocks and dead coral slabs from intertidal and shallow subtidal habitats to 15m depth. Like many other whelks of this family (Buccinidae), the shell is scupltured with spiral cords and nodules. Although the precise diet of this species is unknown it is likely that it preys on worms or small molluscs, as do other species in the family.